Please Note: The Cozy Cabin in the Mountains is run out of the office of Gentry Surveying Company, so the office is open Monday through Friday from 8am-3pm. Holiday Hours Vary. Please call me or E-Mail me and I can answer any questions you have. Come relax by the fireplace with a hot cup of cocoa after a fun day of skiing in the winter, or enjoy a nice cold beer while BBQing in the backyard in the summer! 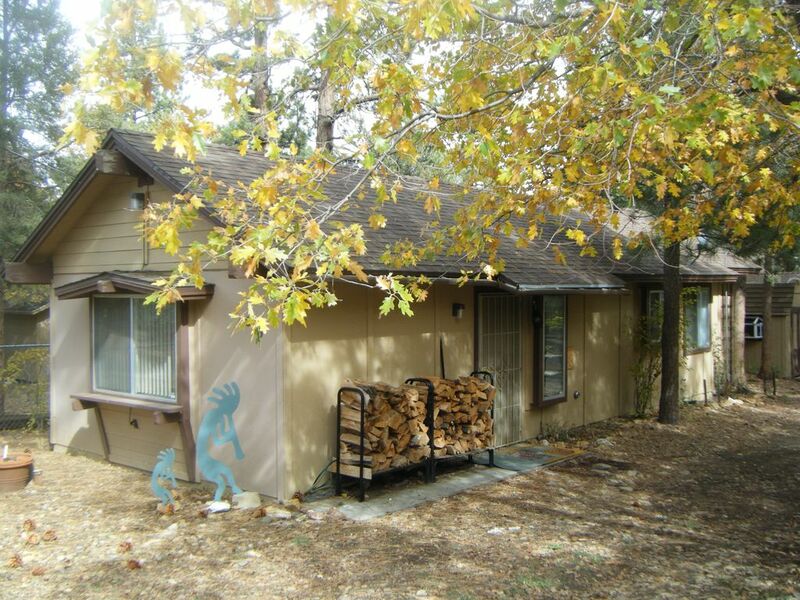 This 2 Bedroom 1 Bathroom Cozy Cabin has an open common area that includes a living room with a cozy futon couch and two recliner chairs to sit in, Cable TV, WiFi, and a kitchen with all the amenities included(please bring own paper type items with you), a coffee maker (Please bring your own coffee and filters) and a fireplace to warm you up (Please bring your own fire wood). The master bedroom has a Queen Size bed, and the guest bedroom has a Full Size bed (Please bring your own pillows, and linens). The Cozy Cabin can sleep up to (6 people). The Backyard has a BBQ with a picnic table to use. The bathroom is a Shower/Bath with a Sink and Toilet (please bring your own paper type items and shower items with you). The National Forest is at the end of the street for hiking and playing in the snow. Please fill out Renters Agreement Attached! I have vacationed in Big Bear for over 12 years, and enjoyed the escape from the mad rush of the city. I have vacationed for many years in the cabin next door to the rental and want to provide others with the same wonderful experience !! The National Forest is located at the top of the street with several trails you can hike and picnic on. I personally enjoy the easy hike to the worlds largest lodge pole pine. Just make sure you remember where you stared. I have several board games if you like. There is a washer game outside that is a blast to play! I can also set up a driving net if you would like to hit some golf balls. If you decidie you would like to play golf at the local course, I can also provide you with clubs. I also have 2 bicycles that you are more than welcome to enjoy as well. You can ride them around Sugarloaf or take them to the path on the North side of the lake which is a nice easy ride. Pot, Pans, Plates, bowls, spoons, knives, forks, cups. Hopefully we will stay there from now on!!! Thank you bryan!! The cabin and the yard was very nice and we enjoyed that the front yard was large with a great scenic view for photographers The inside of the cabin was cozy and the heater was a life saver. We will be staying here again, but There were a few things that we did wish we would have known before hand. For instance, the WiFi router seems to be in another location because our WiFi service was decent but without it I personally had no reception. If you enjoy cooking I would suggest bringing your own cutlery set. Pots and pans and silverware are there. Other than that the place was fantastic and I would absolutely recommend it if you have a family or a dog or all of the above. Next time we rent we are definitely going to bring our husky for her first snow trip!! Thank you guys so much for allowing us to stay here. The place was great!! The cabin was cozy and adequate. However, it could use a good cleaning. We had a great stay! Cabin was clean and comfortable. Yard was fully fenced for the dogs. Restaurant, market, and sledding hill all walking distance. Was overall a great trip! The Renter is to let Owner know within a minimum of 30 days prior of any cancellation, or a cancellation fee will be incurred.